Sometimes you need a big lawn sign. Here’s an easy way to do it- use a coroplast sign attached to wooden stakes. 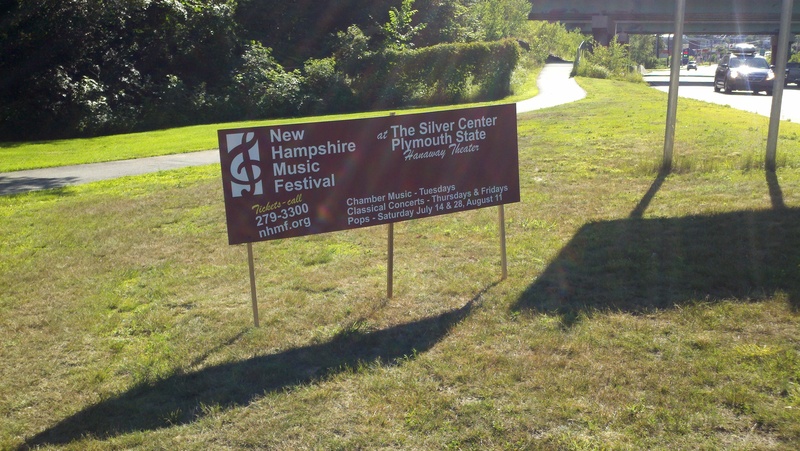 This is a sign we produced for the New Hampshire Music Festival to announce their 2012 season. The sign is 2×6 feet in size, and we attached it to three oak grade stakes driven into the ground. We used drywall screws to attach it. It survived the winds and rain of last night’s thunderstorms, so it’s pretty stable! Fixturing is always the thing we worry about with signs and banners. Honestly, the printing is easy, but being sure that it can be installed without a lot of fuss can be a problem. You can buy grade stakes at the hardware store for a dollar each, drive them into the ground with a hammer, and you are good to go with a very simple and effective temporary sign. This entry was posted in Flatbed printing and tagged coroplast signs, event sign, temporary sign. Bookmark the permalink.